Blue Cross Blue Shield of Michigan has approved a plan to contract with St. Louis-based Express Scripts Inc. for its retail commercial business in Michigan. Blue Cross Blue Shield of Michigan has approved a plan to contract with St. Louis-based Express Scripts Inc. for its retail commercial business in Michigan. The contract is effective Jan. 1. The decision to shift network management of 2,400 pharmacies from about eight in-house employees to Express Scripts is intended to reduce administrative costs and pharmacy prices for the Detroit-based health insurer. It is also intended to increase choices and create flexibility for the Blues' 2 million members who have pharmacy benefits in multiple product offerings. "We are doing a lot with pharmacy. We want to deliver value for customers and members because prescription drug costs continue to mount, skyrocket," said Kevin Klobucar, Blue Cross' executive vice president for health care value. "Drugs are going up 200 percent to 500 percent in costs, in some instances, and we are trying to make it affordable." Klobucar said Express Scripts already manages Blue Cross' out-of-state pharmacy network and the company's Medicare Advantage business. "Customers won't know the difference," he said. "We have 99.9 percent of pharmacies in our network. The 30 pharmacies not in (Express Scripts') network, we are reaching out to them" for contracts. 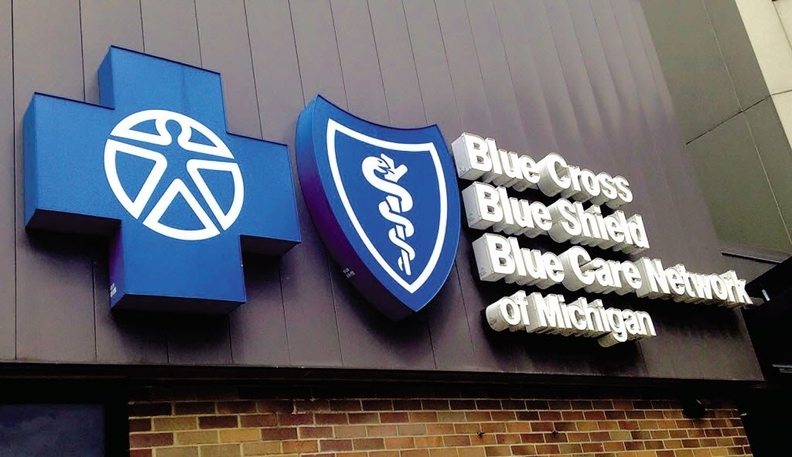 The eight Blue Cross employees in the pharmacy benefit department will be able to apply for other jobs at the company, said Helen Stojic, Blue Cross' director of corporate communications. She said the cost savings are not part of Blue Cross' three-year program to reduce administrative costs at least $300 million by 2018. For example, pain and arthritis drug Fenoprofen Calcium capsules have increased 262 percent this year to $17.58, insomnia spray Zolpimist increased 843 percent to $102.70 per unit and diabetes inhaler Afrezza increased 101 percent to $7.94 per unit. "It affects employers, health benefits of employees. Those cost increases put pressure on deductibles and pocketbook costs," Hetzel said. "We feel working with Express Scripts will make us more cost-competitive (and allow us) to better manage costs." The Express Scripts contract will cover all commercial plans, including self-funded employers, small groups and the individual market. It also will require the pharmacies to sign contracts directly with Express Scripts, which will credential the pharmacies. Klobucar said Express Scripts will manage the pharmacy network more effectively and lower costs an unspecified amount because it is a larger company with more resources. Express Scripts is the nation's largest pharmacy benefits manager. "The pharmacy business is very competitive," he said. But Blue Cross will continue to oversee pharmacy fraud, waste and abuse programs to ensure costs remain as low as possible. "On opioids, we are putting in more and more limits to prevent overuse and that results in improved safety," said Atheer Kaddis, vice president of pharmacy benefits. "On fraud, waste and abuse activities, we are trying to reduce bad behaviors out there, and that helps reduce costs." Klobucar said the Express Scripts contract will also enable greater integration of medical and pharmacy benefits in product design. For example, when an employer selects both medical and pharmacy benefits, members will also gain access to integrated management that gives providers data on prescriptions to address gaps in medical care, he said. Kaddis said another benefit with Express Scripts is that it will allow Blue Cross to offer customers a customized pharmacy network, or a narrow pharmacy retail network, for further price reductions. "We can offer in benefit plans a narrow network to get deeper discounts. We don't have that now," he said. Express Scripts also offers customers 90-day retail pharmacy dispensing plans to make it more convenient for certain customers to purchase prescriptions in three-month supplies. Under the longer-term prescription plans, patients fill their prescriptions in 90-day supplies either through home mail delivery or by visiting specified retail pharmacies. Over the past year, Blue Cross has taken several steps to reduce pharmacy costs, Klobucar said. In April, Blue Cross moved to reduce pharmacy costs by requirement members to seek prior authorization for infusion services requiring the administration of intravenous drugs conducted at hospitals or affiliated outpatient centers, where prices are higher. Blue Cross is seeking to direct patients to lower-priced outpatient providers or in-home services to reduce health care costs and hold down premiums. Employers and individuals have been demanding health insurers contain rising costs, especially pharmacy costs, and patients have begun to realize they pay much more out of pocket with high-deductible benefit plans if they go to higher-cost settings. "Another piece is formulary management, what tiers are covered, use of generics and our utilization management strategy," Klobucar said. "Blue Cross Michigan signs deal with Express Scripts" originally appeared in Crain's Detroit Business.